OPI Innie Minnie Mightie Bow was sent for review. All opinions are my own honest thoughts. To complete my swatches of the OPI Couture de Minnie collection, today's post is the lovely OPI Innie Minnie Mightie Bow. 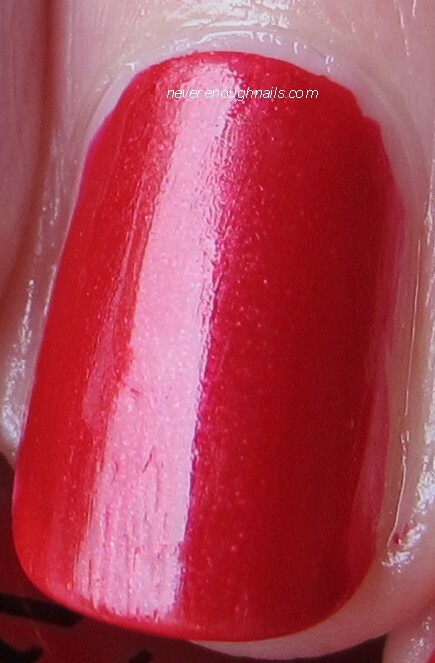 Innie Minnie Mightie Bow is a very pigmented cherry red smooth shimmer. It's the kind of shimmer that you can't see individual shimmer flecks, but it is just all throughout the polish. I know this is a summer collection, but I can't wait to rock the heck out of this polish at Christmas! Innie Minnie Mightie Bow has a fantastic formula. It is so pigmented that you could probably get away with one careful coat. It has a perfect consistency and glides nicely on to the nail. I can't think of a single complaint here! Are there probably some similar polishes out there? Yes. But Innie Minnie Mightie Bow has an outstanding formula and great pigmentation, so if you like reds at all (even just at Christmas), I suggest you pick this one up! I think I mentioned this in my original Couture de Minnie post, but I can't get over how much I love this collection, considering that it's filled with reds and pinks (and I don't wear reds or pinks very often!)! The OPI Couture de Minnie collection is available now at professional salons, including Beauty Brands, Beauty First, Chatters, Dillard’s, jcp Salons, Pure Beauty, Regis, Trade Secret, ULTA and ulta.com for $9.00 ($10.95 CAN) suggested retail for each nail lacquer. I have this too and absolutely love it! It is gorgeous! Glad you love it Polish Alcoholic!